Leadership and developing future Brangus breeders has always been at the forefront of the IJBBA. Throughout the years IJBBA Boards participated in leadership activities when they met; however, IJBBA’s Leadership efforts culminated on September 2-3, 2000, when the IJBBA hosted its first IJBBA Junior Leadership Workshop in San Antonio, Texas. Active members from eight states met over Labor Day weekend to participate in the event conducted by the IJBBA Board of Directors. Changes within the association put a delay on a follow up conference until 2015, when IJBBA hosted one of the most successful, most engaging conferences in the nation - the Inaugural IJBBA Legacy Leadership Conference. Over 100 juniors from 8 states attended the conference to learn more about the Brangus breed and the cattle industry. What makes the IJBBA Legacy Leadership Conference so unique is that it is open to any junior interested in participating - regardless of whether or not they are an IJBBA member. The IJBBA Legacy Leadership Conference is held in every odd numbered year and hosts juniors from across the nation. The IJBBA Board of Directors will begin planning the 2021 Conference soon! If you have ideas or suggestions for the next conference, contact us today! Information will be posted here as soon as it becomes available. 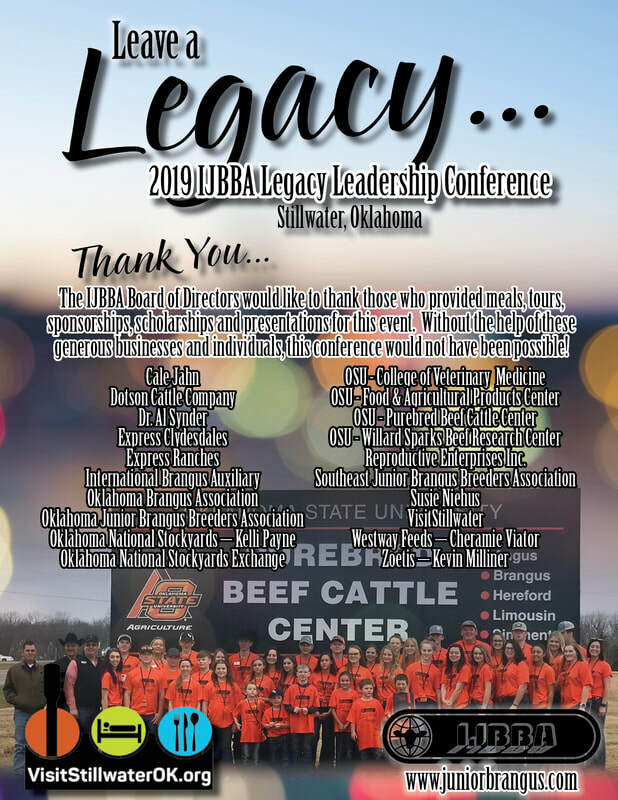 We would like to thank everyone who helped make the 2019 IJBBA Legacy Leadership Conference a huge success!! !